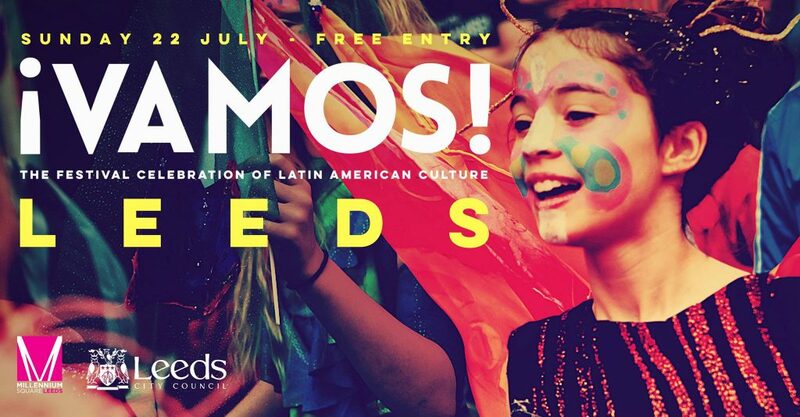 Back for the 4th edition of ¡VAMOS! Leeds! We’ve a fantastic family-friendly event in the heart of the city! Part of Leeds City Council’s Millennium Square ‘Summer Series, one of the UK’s longest running community arts festivals embracing Spanish and Portuguese speaking cultures – ¡VAMOS! Leeds returns for it’s forth edition. Manchester based Cuban band led by pianist Jesus Moreau Batallan and featuring top UK based Cuban musicians from across the country, including members of Salsa Celtica and the Omar Puente band. They play the contemporary Cuban salsa sound called Timba and make a welcome return to ¡VAMOS! Leeds after their debut appearance at ¡VAMOS! Leeds 2 in 2016. Bringing some Havana spice to the heart of Leeds to close this year’s festival. The newest Samba school to emerge in the north of England over the last 18 months and based in Leeds, they are led by master percussionist Gez Heb and feature Samba drummers and Samba dancers. As well as performing at venues and festivals across the UK, they also run Brazilian percussion and dance workshops and can often be seen and heard busking around Leeds city centre. Tarantismo are a six piece Cuban Son music meets Salsa band from Leeds and are fronted by Chilean singer Ana Luisa Munoz, a mainstay of the local Latin scene of the last decade fronting several bands. Tarantismo specialise in the Cuban roots music of Salsa, Son Cubano, a sound made famous in the 90s by the legendary Buena Vista Social Club. They add a bit of Puerto Rican Salsa spice to their Son Cubano giving it an edgier urban feel compared to the original form. Opening up this year’s festival so get down early for a dance and some Cuban rum. DJ Lubi – as always, our host and resident DJ is original Leeds Salsa/Latin music legend DJ Lubi who has been promoting events and DJing Salsa/Latin music since 1985. Compiler of 50+ Salsa/Cuban/Latin music compilation albums, international DJ with several hundred gigs across 25 countries worldwide, music journalist, radio show presenter and all-round expert on all things Salsa/Cuban/Latin/Brazilian music, he’s playing sets around the live sets and will be hosting/MCing the whole day. Too much to mention about this original UK salsa/Latin music pioneer so check more out at his website. ▶ ¡VAMOS! LEEDS is a FREE family friendly open-air event for EVERYBODY! Sunday Salsa Social at Revolucion De Cuba Leeds takes place on Sunday 22nd July from 7pm and will be the after-party for this year’s ¡VAMOS! Leeds Festival. Entry is just £3 and DJs on the night are Lubi plus fellow Calle Ocho Leeds DJ Fabio Bahia. They’ll be playing Salsa, Mambo, Timba, Son Cubano, Bachata, Merengue from 7pm until late.